On February 19, teachers and other education workers shut down schools across West Virginia, beating back a legislative effort to reverse the gains of last year’s nine-day strike (see “West Virginia School Strike: Militant Union Battle Ends,” WV No. 1129, 9 March 2018). Members of the American Federation of Teachers (AFT), the West Virginia Education Association and the West Virginia School Service Personnel Association, which includes school bus drivers, struck in opposition to Senate Bill 451 (SB 451), a frontal attack on public education. Widely seen as retaliation for last year’s strike, SB 451 would have drained state funds from public schools toward subsidizing tuition for private and religious schools; established charter schools in the state for the first time; eliminated seniority and made firing teachers easier. Four hours into the walkout, legislators temporarily postponed the bill. Determined not to be stabbed in the back again by the legislature, the teachers stayed on strike for another day. Last year’s strike sparked a wave of teachers’ walkouts across the country, many in “right to work” states like West Virginia, where teachers are prohibited by law from striking and lacked collective bargaining rights. The architects of SB 451 cynically thought they could buy off the teachers by tacking on an extra 5 percent wage increase, seeking to divide the teachers from the many parents and others who supported their defense of public education. As one striker stated: “Our students are not for sale…. We’ve seen the charter school system fail students all across the U.S. and that’s why we are risking our pay raise to defeat this bill” (jacobinmag.com, 20 February). The power of strike action was further seen two days after the strike, when a separate bill granting the pay increase was passed by the House of Delegates. The teachers showed that waging class struggle is the only way to win. They faced down not only the anti-labor legislators, but also the pro-capitalist misleaders of their own unions. Teachers had been calling for a work stoppage for weeks before the union tops agreed to sanction a strike. Union tops finally yielded to the teachers’ calls for a work stoppage to kill this bill. Five days before the strike, Fred Albert, president of the West Virginia AFT, was encouraging his members to accept an earlier version of the bill that would have also allowed charters—just at a slower pace. AFT national president Randi Weingarten had the same position. In an attempt to justify his sellout position, Albert pointed to the lack of a Democratic legislative majority, which “presents a completely different scenario than last year”—a clear illustration that the union tops’ ties to the Democrats are a stranglehold on labor struggle. No less than the Republicans, the capitalist Democrats have championed charter schools, attacked public education and vilified teachers unions. The ongoing effort by the bourgeoisie in West Virginia to gut public education underscores that any strike settlement, even a successful one, is only a temporary truce in the ongoing class war. Every gain wrested by the workers and oppressed will be under attack until the capitalist rulers are swept away by a workers revolution that establishes a workers government. When those who labor rule, the vast riches that are today pocketed by the capitalists will be used to begin rebuilding this society for the benefit of all, including quality, integrated public schools from coast to coast. 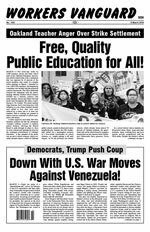 Down With U.S. War Moves Against Venezuela! For a Catalan Workers Republic North and South of the Pyrenees! For Womens Liberation Through Socialist Revolution!